It was I think last month or few months ago when we have our previous iPad giveaway. There were a lot of people who feast the blog and joined the giveaway. If only I could give everyone an iPad, I would but I can’t. So I hope with this giveaway, I’m giving another chance to other’s who wish to have their very own iPad! 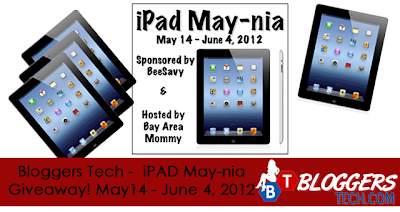 Bloggers Tech, Bay Area Mommy and with the awesome and generous bloggers has partnered with BeeSavy for this giveaway! BeeSavy is your very own digital shopping assistant that pays YOU for serving you! That is right, you’ve read that right too! The BeeSavy polishes the internet to make sure you have the lowest prices on the products you want at the stores YOU love. The great thing about it is that, BeeSavy gives you cashback on your purchases! Pretty cool huh? Visit BeeSavy to save more today! This giveaway will end on JUNE 4, 2012 that would be on my birthday. So hopefully, we’ll get some real fun on that day. I’m still thinking of some ways to celebrate it UNIQUELY online, since I don’t usually let people know it’s my birthday, because I’m getting older. But anyway, let’s start with this gadget shall we? This iPad giveaway is OPEN WORLDWIDE, if ever the winner will be from outside the US you’ll receive the $499 cash instead, and maybe buy the gadget yourself or save the money for something. To join this giveaway, just fill up the rafflecopter below. Please take note to give your real account so that we could verify you right away, and that you could claim your NEW iPad gadget. I hope you will enjoy this giveaway and THANK YOU EVERYONE FOR JOINING and for your love and support!